PEARLS ARE A GIRL'S REAL BEST FRIEND! 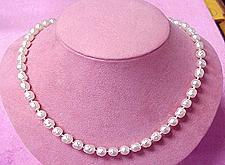 DiamondsHere.com has a HUGE selection of Japanese Akoya pearls and Chinese fresh water pearls . A RAINBOW OF COLORED PEARLS! SUPERB VALUE! DiamondsHere.com offers a HUGE variety of millimeter sizes and different lengths...be sure to call with any specific strand you may be searching for...WE HAVE IT!...and at DISCOUNT PRICES! 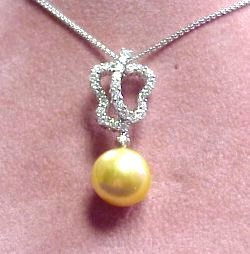 At DiamondsHere.com, we can customize a pearl strand to the perfect length for you...AND, provide you with a huge selection of 14K or 18K clasps to complete a perfect strand! Allow us to demonstrate to you why we are one of the best in the fine jewelry industry (since 1984). We offer a 14 day return policy and guarantee your satisfaction! Please take a moment to browse through this weeks offering to discover our DiamondsHere.com quality and prices! Check out the HOTTEST pearl on the planet this year...the Chinese freshwater pearl...maintains it lustre and nacre and their matched shape for roundness is unbelieveable...please call for availibility of lengths and widths...our DiamondsHere.com hours ...OPEN 6 DAYS A WEEK 9:00 a.m. to 5:30 p.m. (Pacific Time). Thank you for shopping at DiamondsHere.com! 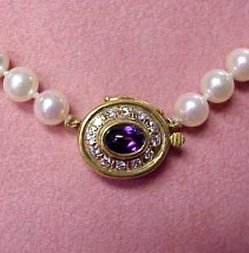 This is an elegant 18K, deep purple cabachon Amethyst and diamond clasp (0.25CT TW) on a strand of 6-6.5mm Chinese Fresh Water Pearls. A beautiful addition to your jewelry wardrobe. The Chinese Fresh Water Pearl industry is RED HOT! These beautiful pearls are formed of solid nacre making every pearl chip resistant, their roundness/symmetry is near perfection! Best of all, prices are affordable for everyone! 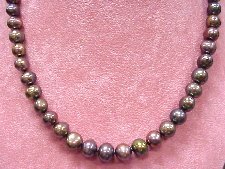 Check out our inventory and discover for yourself these terrific pearls! Your satisfaction is guaranteed at DiamondsHere...AND...NO SALES TAX IN OREGON! 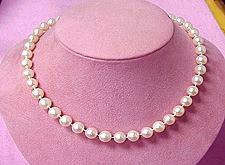 9.5-10mm Cultured Chinese fresh water pearl strand. 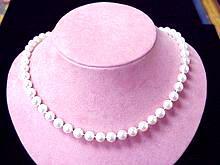 These pearls are solid nacre, smooth and creamy white and they will never chip. Comes with a 14K gold safety clasp! 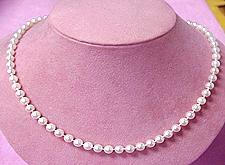 Japanese Akoya pearl strand with lovely rich peach color, then pearls measure 7.5mm width and come in 20 inch length. Comes with our 14K gold clasp. 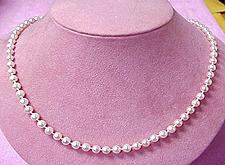 12mm Chinese fresh water pearl strand. 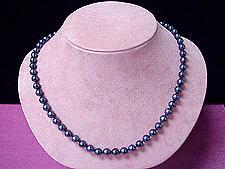 6mm black cultured Japanese Akoya pearl strand with 14K safety clasp. These come in 18 inch overall length and are individually knotted in silk. Japanese Akoya in 29 inch length x 6mm width in perfectly matched AA+ quality, with our special DiamondsHere 14k yellow gold clasp of course! 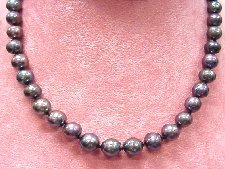 10mm black pearl strand that measure 34 inches in length. 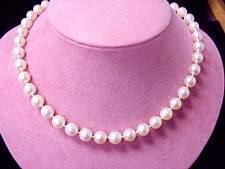 Awesome Japanese Akoya 9mm pearl strand comes in 16 inch length and individually knotted in silk with 14K gold clasp! 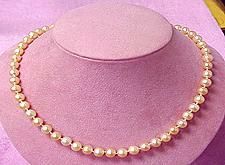 8mm x 18 inch freshwater pearl strand with our solid 14K gold clasp. Flattering at any age.